This week's document for Amanuensis Monday is the 1778 will of James Stone (1702-1783) of Groton, Massachusetts. him, is his full share out of my Estate. she hath already received, is her full share out of my Estate. share out of my Estate. full share out of my Estate. The will was proved in Middlesex County Probate Court on 15 April 1783. The probate packet includes a notice, an affidavit, a letter testamentary, a bond, and an appointment of the executor. 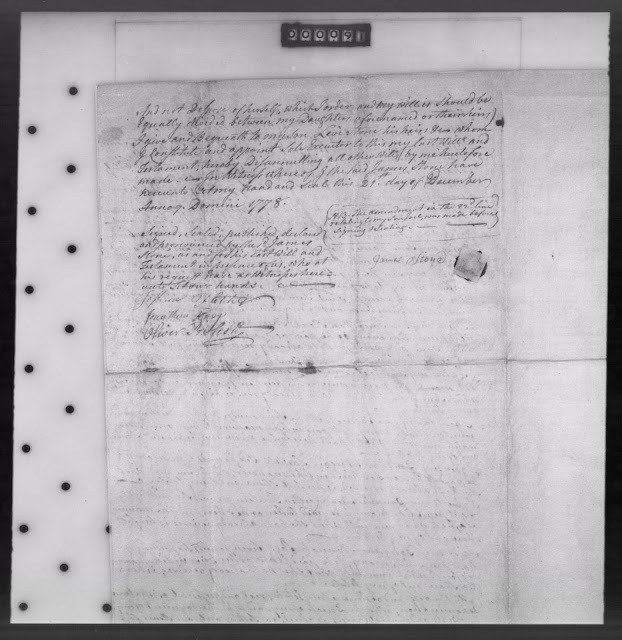 However, no inventory, account or distribution is included..
"Middlesex County, MA: Probate Papers, 1648-1871," digital image, Ameircan Ancestors (http://www.AmericanAncestors.org : accessed 27 November 2016), Case 21,617, 8 images, will of James Stone, 1778, proved 1783. 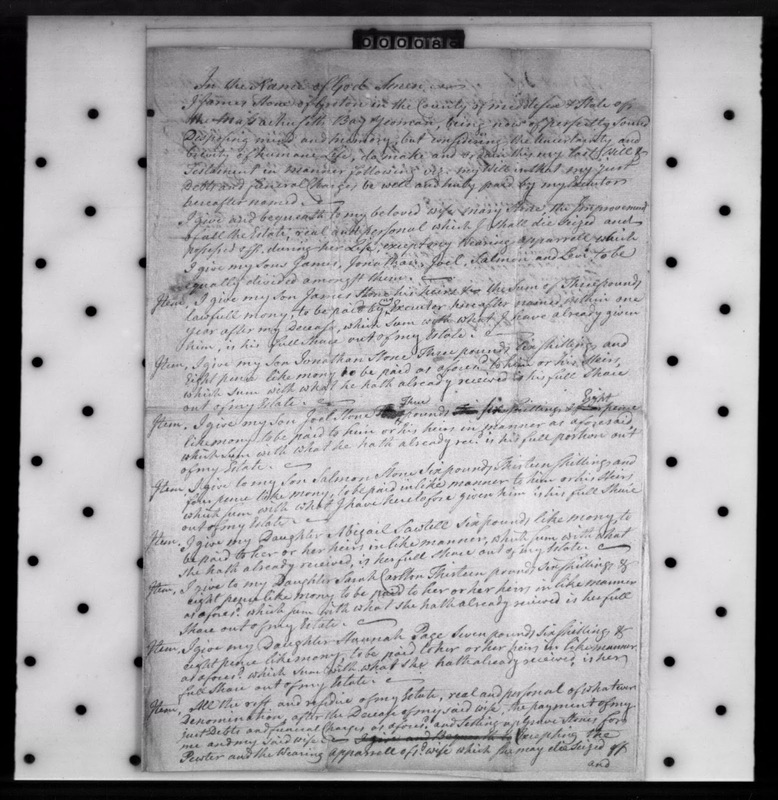 James Stone and Mary (Farwell) Stone had ten children, and eight of them were living in 1778 when James made his will. The will names his widow Mary, sons James, Jonathan, Joel, Salmon and Levi, and daughters Abigail Sawtell, Sarah Carlton and Hannah Page. Each of the children received a bequest of money, the sons received his wearing apparel, his daughters received the pewter and wearing apparel of their mother, and Levi Stone received the balance of the estate, and was named the executor of the estate. James and Mary (Farwell) Stone are my 6th great-grandparents, through their daughter Abigail Stone (1737-????) who married Ephraim Sawtell (1735-????) in 1757 in Groton, Massachusetts.